Photo. 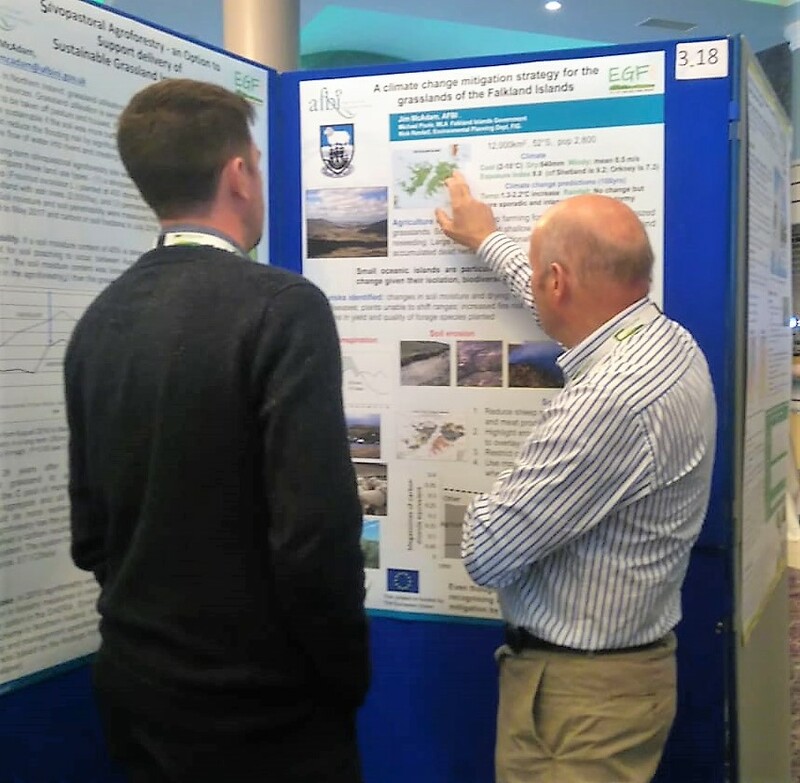 Jim McAdam (right) discusses climate change and sustainable grassland management in the Falklands with a fellow scientist at the European Grassland Federation meeting in Cork in June. Photo courtesy of Geraldine McAdam. This interesting conference gave Trust consultant Jim McAdam the opportunity to highlight some of the Trust’s previous innovative work on seaweed in the Falklands and apply it to addressing current sustainable agriculture challenges. Use of seaweed as fertiliser – Some old FIT research from the Falklands with a timely message for the future. The recent extremely hot, dry weather in the UK highlighted the susceptibility of our grasslands to drought. Most of the sown grasslands in the British Isles are based on one species, perennial ryegrass, a very productive, high yielding grass with a long pedigree of bred varieties. However ryegrasses are relatively shallow rooting and in the recent drought, grass growth slowed down considerably, creating huge problems for grassland farmers. If we are looking to develop more sustainable grasslands in a future scenario where dry spells such as we have just had, become more common, then we need to take a serious look at the species and varieties we sow or manage in our natural grasslands. Cocksfoot is a deep-rooting grass, well renowned for its drought tolerance and, although more difficult to manage and a little less productive than ryegrass, used to be more widely used. 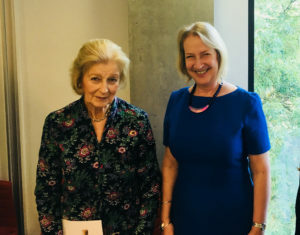 Bred strains are available so we should consider using Cocksfoot more in the future – and carry out research necessary to support its use in sustainable farming. There is increasing concern about the use of oil-based artificial fertilisers and future farming systems are increasing looking to using more “natural” renewable products such as seaweeds. Jim could find no published research on what happens when you put the two together as a potential future grassland option – using Cocksfoot and testing its’ response to seaweed fertiliser. Cocksfoot grows well in many reseeds on the Falklands where, as we know, summer droughts particularly exacerbated by the strong spring winds can be a feature of the climate. Climate change predictions for the Falklands are much the same as the British Isles – getting warmer, drier and windier in summer, but in the Falklands with the shorter growing season and less fertile soils, the effects will be proportionally greater. Hence the importance of considering and trialling future grassland improvement options. There are also substantial seaweed (kelp) resources around the waters and on the beaches in the Falklands. With this in mind as far back as the mid -1980s, through the Falkland Islands Trust, he carried out a series of trials on the effect of liquid seaweed extract (some made in the Falklands, some imported) on the growth of Cocksfoot. One, with Aidan Kerr (then ARC) at Fitzroy in the early 1990s, was previously presented at a conference. The other piece of work, a trial on the effect of liquid seaweed extract and artificial nitrogen fertiliser on what was planned to be the grass airstrip on Keppel Island, was carried out with the able assistance of Sam and Hay Miller, then owners of Keppel, was never widely reported. At that time there was not the same interest outside the Falklands. That situation has now changed. As we in Ireland were in the midst of the hot, dry spell of weather, our grasslands were distinctly suffering and Jim thought of the message from that earlier research done on Keppel Island in the Falklands on the role which Cocksfoot, as a deep rooting, drought-tolerant grass and seaweed, as a sustainable fertiliser source could play. Jim submitted the idea of a paper – Can seaweed have a role in sustainable grassland management? – The response of Cocksfoot to liquid seaweed extract.- to the organisers and it was presented as an oral presentation at the meeting. As well as making a potential contribution to a real and pressing agricultural problem, it highlights the value of research carried out in the the Falklands. This is important research towards a more sustainable agriculture! The soil mapping project is underway! This Darwin-Plus funded project “Soil map and online database as climate change mitigation tools” officially started in April. The Falkland Islands prioritised climate change mitigation action plan considers soil erosion, soil carbon content vulnerability and climate change assessments at policy level as high to medium priorities. To support these mitigation policies a baseline survey of soils, peatlands and erosion extent/risk will be undertaken and the results conveyed on an online data system to assist policy makers, conservation officers and land managers in deciding which actions are needed for long term mitigation measures against climate change effects. Progress. A project manager, Dr Stephanie Carter, has been appointed and is now based in the islands-in the SAERI office. 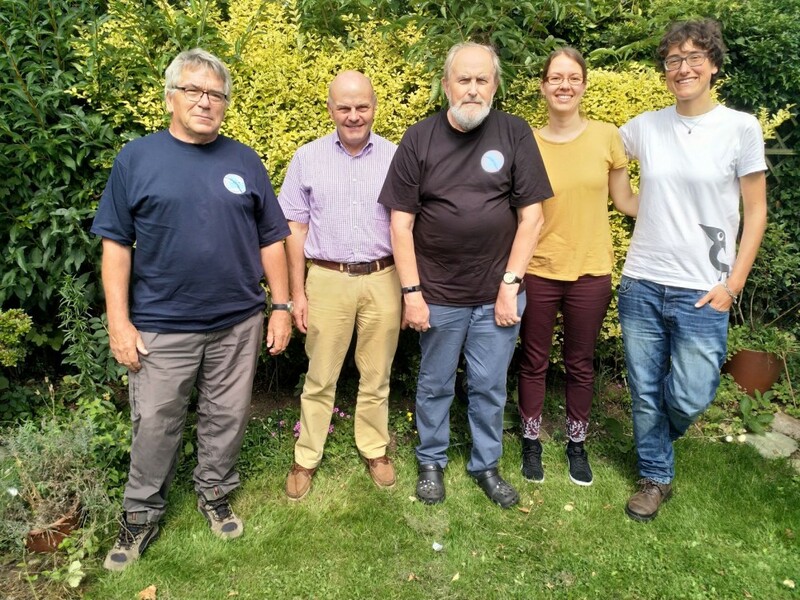 I participated in the recruitment process and in a 2 -day induction and soil survey training meeting with Rodney Burton, iLaria Marengo and Stephanie Carter in Cambridge in August. Project meeting and soil survey training course, Cambridge. Left to right ; John Hazelden, Jim McAdam, Rodney Burton, Steffi Carter, iLaria Marengo Photo courtesy of R Burton. A group led by SAERI and including FIT as Agricultural Advisor have just been successful in their Darwin Plus project bid –Soil map and online database as climate change mitigation for the Falkland Islands. This is a logical follow-on to the climate change project. FIT role in this project will be for consultant Jim McAdam to act as Agricultural Advisor. This will involve transferring the outcomes from the TEFRA project and putting them into practice in the current project, in particular towards the assessment of erosion extent, risk and mitigation measures. This will involve engaging local stakeholders, especially farmers, and helping the Project Manager to understand their needs and how to answer them. We will verify and refine the erosion risk maps for some sample farms. Prof McAdam will be starting the planning for this project with SAERI staff during his forthcoming visit to the Falklands. 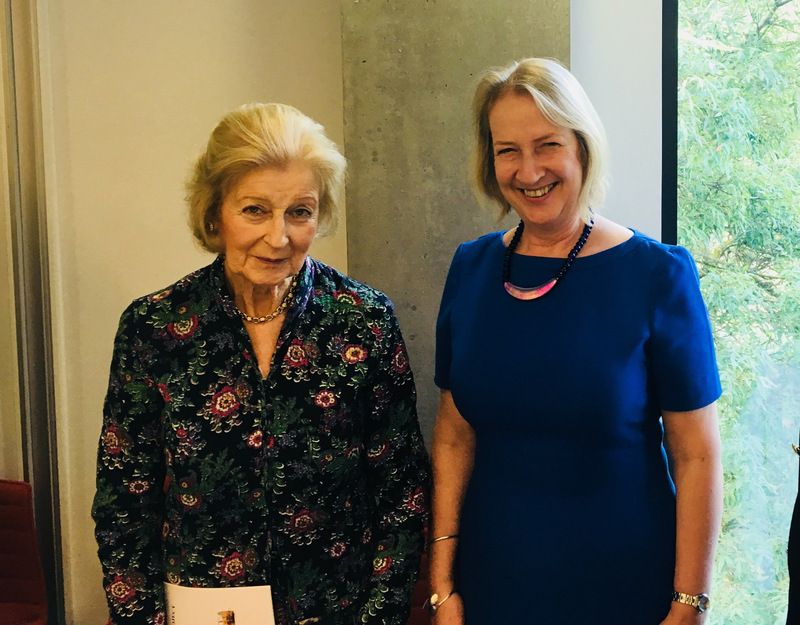 Awayday held by the Trust at Kew Gardens…..
Our Patron HRH Princess Alexandra attended and was presented by Jim McAdam with a copy of his 25th Anniversary Report on the Alexandra Wood. Trust presented a poster at the annual “ Farmer’s Week”….. In July 2017, along with Falklands Conservation, FIG Department of Agriculture and Agronomist Enrique Frers, the Trust presented a poster(attached) at the annual “ Farmer’s Week” meetings to promote the idea of transferring the technology of a mechanical Tussac Grass planter to the Falklands. The Trust’s consultant, Jim McAdam visited the Falklands….. The Trust’s consultant, Jim McAdam visited the Falklands in February and March 2017. 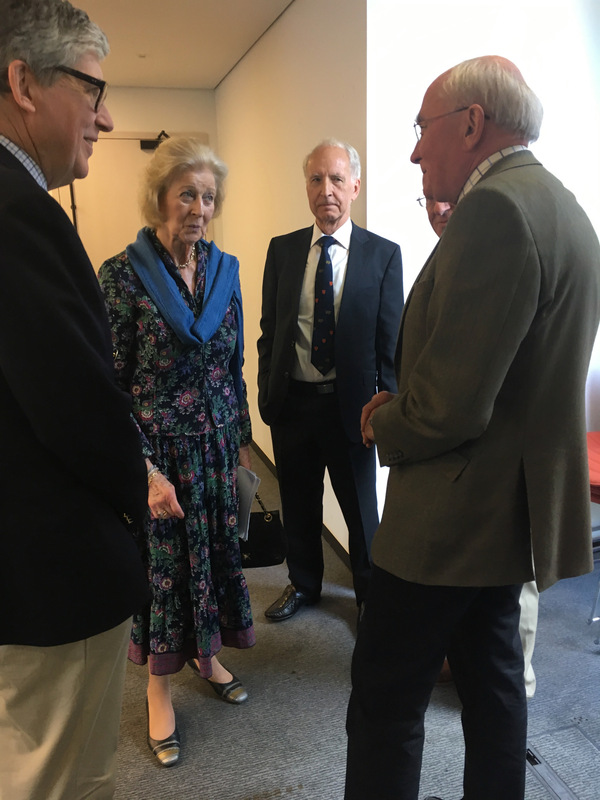 He participated in the soil survey project led by Rodney Burton ( a Shackleton Scholarship project), gave a public lecture on The Falkland Islands Trust and had discussions on other projects the Trust is participating in. Trust’s consultant contributes to scientific paper…..
Trust’s consultant contributed to a scientific paper in the prestigious scientific journal Plos One. Trust contributes to FIG’s Mapping Rural Renewable Energy Resources project. Jim McAdam gave a presentation “THE RESPONSE OF A SMALL ISLAND STATE TO 1.5°C CLIMATE CHANGE – THE EXAMPLE OF THE FALKLAND ISLANDS” at a major climate change conference in University of Oxford on behalf of the Falkland Islands Government.